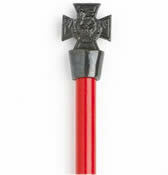 TP664 - Norse Nal Forklore Pewter Brooch. 4" long. Two pieces with pewter chain connection. Hand cast in Norway by the artist; this solid pewter jewelry is of the highest quality of level of detail. This is the quality of jewelry handed down for generations and cherished for its unique beauty. See our other fine brooches, earrings, necklaces and cloak clasp in hand cast pewter. 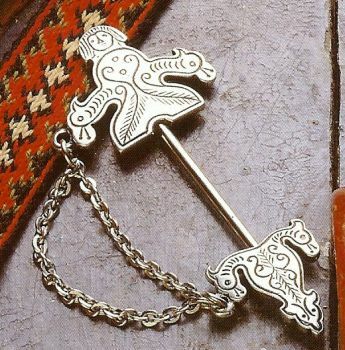 Bygdetinn Brosje is a collection of brooches and other jewelry inspired by Norwegian culture and traditions. These designs are inspired from a variety of brooches and designs found throughout Norse and Viking culture and history. Ring brooches are one of the most characteristic articles of jewelry worn during the Viking Age (800-1050 AD). It has the origin of the Roman fibula, and its present day successor, the solje or silver brooch worn with the Norwegian national costume. In the Aett range of jewelry, the artist has been inspired by the traditions of the Viking era to create this beautiful ring brooch, and elements from its design are repeated throughout other pieces of jewelry. See our entire line of this elegant Pewter Horse brooch collection.